It’s not clear why people are making distinctions between the younger & the older Elie Wiesel. By his own admission, he tried to join the Irgun terrorist group in 1946 at the age of 18, inspired by their treacherous bombing of the King David Hotel in Jerusalem. Two years later, he was translating for them in Paris. He didn’t try too hard to join Irgun. He said “I got no further than the janitor who asked: “What do you want?” I said, “I would like to join the underground.” He threw me out.” A more committed terrorist wouldn’t be deterred by the janitor. You can claim that it took him years to morph into hateful all you like, but to some it looks like a straight shot from admiring the bombing of a hotel packed with travelers to defending the bombing of civilians in Gaza. A simple question: how has Drumpf become the international standard for dangerous politics when Clinton has the proven record for violent treachery? That’s not to absolve him from criminality at all. But making him the standard is a backhanded way of designating her the lesser evil. Clinton is vetting Cory Booker to be her vice presidential nominee. Can you hear the sucking sound from the “Bernie or Bust” campaign rushing to the Democrat’s slate as the lesser evil? There is every reason to be alarmed by the inauguration of Rodrigo Duterte as the new president of the Philippines. Duterte, now 70-years-old, was the iron-fisted mayor of Davao city for 22 years. It’s quite clear he was enlisted by politicians & businessmen at the highest levels of Filipino power to become president–most likely because they face resistance to the imposition of neoliberal policies & to the re-militarization of the country as part of the US military buildup in the Asia-Pacific region. Their choice of Duterte, nicknamed “Duterte Harry,” indicates they intend to use repression against those who oppose their policies. Beginning in the mid-1990s as the mayor of Davao, Duterte became associated with the Davao Death Squad (DDS), a vigilante group that summarily executed or disappeared hundreds of people suspected of petty crimes (like theft or cell phone snatching), those suspected as drug dealers or addicts, or street children in a country with 1.5 million homeless children. The total number killed in Davao between 1998 & 2015 is estimated at 1,424 people. Fifty-percent of them were children under of the age of 17 or young adults, male & female. Most of them were murdered in urban poor areas. Most of the victims were unarmed & shot in cold blood. There wasn’t a single drug lord reported among those murdered. Duterte also warned drug addicts that “If you’re into drugs, I’m sorry. I’ll have to apologize to your family because you’ll surely get killed.” He has congratulated police who execute drug users & offered them bounties to do so. Drug use is a social & a health problem, not a crime. What Duterte is doing is modeling the US war on drug policies that led to summary execution of hundreds of Black youth, the incarceration of thousands, & martial law in the Black community. 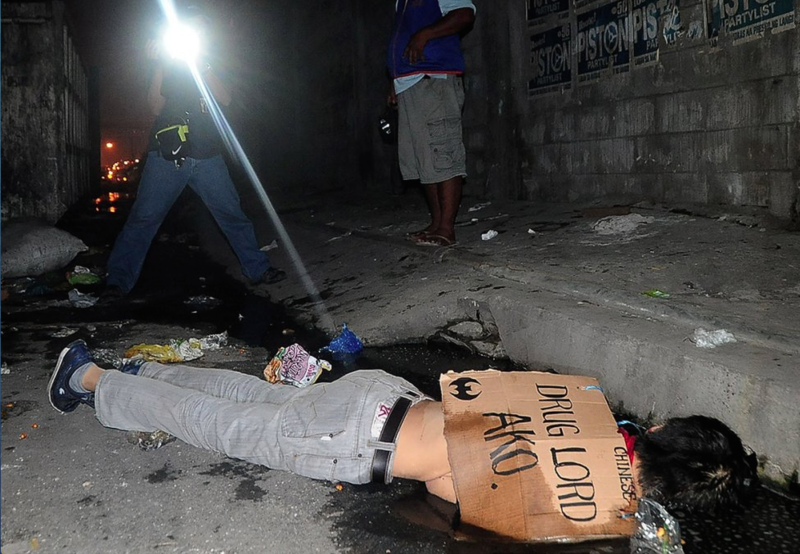 Since his election, dead bodies of suspected drug dealers & users have turned up across the Philippines–some executed by police & some by vigilantes who dump the bodies on public streets. Handwritten warning signs are left on some of the bodies. Estimates are that one person has been shot dead every day since the May 9th election of Duterte–shot dead at his incitement & with complete impunity. In the grand scale of things, shooting down drug addicts & journalists is only the prelude to the massive use of violent repression against the urban poor being forcibly evicted from slums, against homeless children, & against all who speak out or protest neoliberal policies & the militarization of the Philippines. Our fullest solidarity with the political movements in the Philippines because they have a huge battle for democratic rights on their hands. How did ISIS rise within a few years to have the military might & geographical scope of a powerful nation-state taking on at least four major military powers at once along with organizing a terrorist auxiliary force operating in Paris, San Bernardino, Dhaka, Istanbul, Baghdad, & with an outpost stronghold in Libya? Who the hell is arming them & why aren’t the armament supply routes blocked? Some of those militaries operating against ISIS stopped the German army in WWII & they can’t stop ISIS, supposedly a paramilitary force? Don’t answer the question with conspiracy theories. Even though other explanations are not forthcoming.